NATURAL HABITAT AND PREFERRED SITE: The ornamental pears are native to China but are well adapted to a wide range of soils, provided good drainage and full sun. 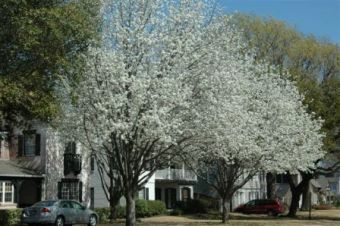 IDENTIFICATION INFORMATION: Bradford pear is an upright deciduous tree with white flowers in the spring and red fall color. The crown of the tree is usually quite uniform and symmetrical looking like a big oval lollipop. 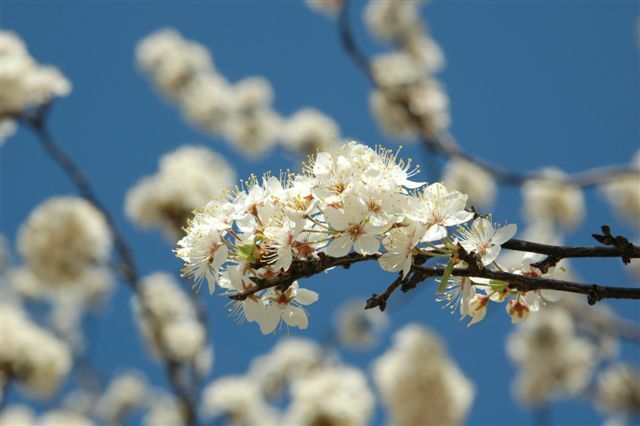 FLOWERS AND FRUIT: Spring flowers emerge before the leaves form. White flowers are showy but have a somewhat unpleasant odor. The flowers are perfect having male and female parts in the same flower. The fruit is ornamental only and ripens in late summer through fall, is no larger than coffee beans, ½ inch in diameter. Fall color can range from orange to scarlet red. BARK: Young bark is smooth, is light to medium gray or brown, developing heavier texture and darker color with age. Mature trunks are shallowly furrowed with an irregular bark pattern. FOLIAGE: Leaves are heart-shaped with rippled edges. Fall color is red and in most years quite spectacular. Leaves are alternate, simple, 2 to 3 inches long, roughly triangular with an irregular sawtooth margin. 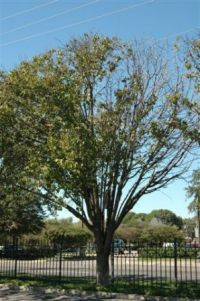 PROBLEMS: Bradford pear and the other ornamental pears are all short lived and subject to root diseases if the soil is not excellently drained and healthy. The Basic Organic Program can usually keep the trees in good shape. Stressed trees that are going downhill should be treated with the Sick Tree Treatment. PROPAGATION: The ornamental hybrid pears are propagated by stem cuttings. Seed will not come true to form. Hybrids can be propagated by grafting or budding. Cuttings are not easy to be successful. 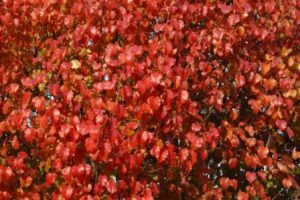 INSIGHT: There are several ornamental pears, ‘Bradford’ is the most common, others include ‘Aristocrat’ which is a tree with more open-branching and actually a superior tree. ‘Capital’ and ‘White House’ are two cultivars that are narrow-growing and have had mixed reviews. I am not a huge fan of any of the ornamental pears unless they are used on a short-term basis for flowers and fall color. They should not be considered a long term tree investment. Bradford pear branching & thinning. The mother plant of these hybrids, Callery pear (Pyrus calleryana) which does have thorns, is a superior plant. This tree’s root system is used as the root stock for many of the commercial fruit trees. Callery pear is more open branching and more of a tree form. It will live longer and have considerably fewer problems. Answer: It sounds as if the trees are goners. If you replant, choose something better than Bradford pear. You might consider Mexican plum and bigtooth maple.